is there a possibility to add multiple Barcodes to a product? Very often I don’t care where I get my milk from. When I’m at home, I’d like to go to the fridge and scan the last milk in there and add it as “milk, 1l” to my shopping list – no matter which brand I bought the last time. Another solution might be to group products such as having a parent product “milk, low fat, 1l” with child products “milk 1l brandX”, “milk 1l brandY” and associate barcodes to those child products. Hi Frederic, thank you for your question. Unfortunately, there is no such capability in Mighty Grocery yet. However, we may consider this feature going forward. 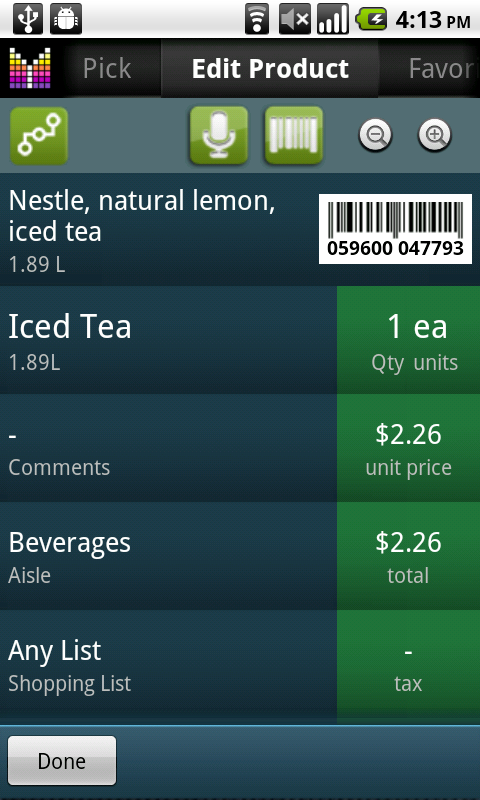 I have recently started using this app and I like it a lot. 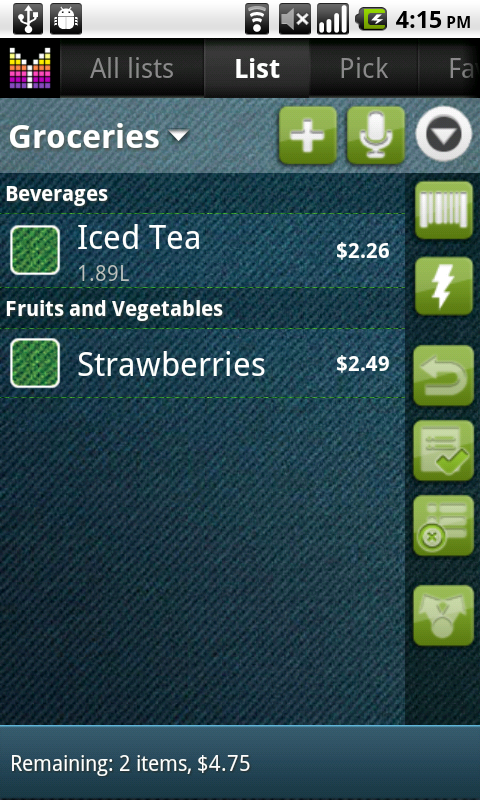 However, the current process for adding barcode-scanned items to the pick list is terrible and cumbersome. There’s only one reason why anyone scans a barcode using this app: because they want to add it to their database to use in future lists right? The method by which one has to do this right now makes absolutely ZERO sense. You have to 1) go to “Pick List” then 2) go to settings, then 3) select “My Picks”, then 4) scan the item (but it doesn’t add it to the list), then 5) SEARCH for the item, and 6) only THEN you can add it to the “My Picks” list. The app should be set up so that you can choose to automatically add any item you scan to your “My Picks” list. It would be even better if you were given the option to just add items to the “Pick List”, and/or integrate your “My Picks” items into the “Pick List” so that they would show up in searches without you having to go and select any special settings. For such an otherwise well-thought-out application, it is surprising how poorly this one feature is implemented. I hope it will be fixed in an upcoming release. Hi Jarrett, thank you for your feedback. Unfortunately, due to a small bug item scanned in “My picks” will end up in “Predefined catalog”. This is scheduled to be fixed in the next update. Thank you and sorry for the inconvenience. Thanks for the quick response. What would be really nice, is if scanned items, scanned from anywhere in the app, ended up in the “My Picks” list. In other words, if I am in the “Grocery List” and I am adding items to that list by scanning barcodes, it would be great for these items to be automatically added to the “My Picks” list instead of me having to go through several steps to get to that list and add them there. Hi Jarrett, thanks for your input. 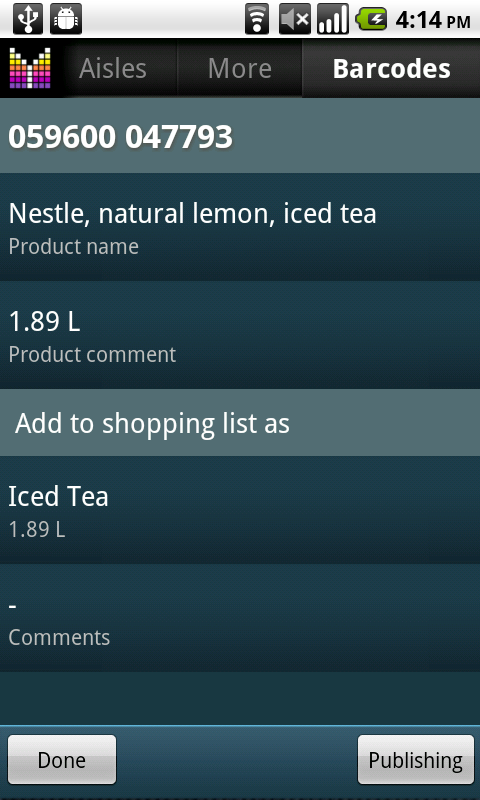 By default, any item added to a shopping list will automatically appear in Pick list. If you checkout an item at least once, it will be moved to history and Pick list item will be kept as long as item exists in History. Therefore the easiest way to scan an item and keep it in the Pick list would be: 1) go to a shopping list, 2) scan item, and change its fields, 3) checkout item(s). OK. So basically, you have to have “checked out” the item in order to make it permanent. Yes that makes sense. I was adding items to test lists out, but when I deleted the items from the list, they got deleted from the pick list etc. as well. Thanks again for the quick response. Correct. After deleting an item from shopping lists and history, it will be removed from Pick list unless it has been listed under Predefined catalog or My picks. Jarret’s question gets to the heart of what a number of the comments have aimed at. There needs to a more intuitive way of adding the items to the permanent list without having to drill down a number of menus to add the item. 2) Click on “Gears” button. Now it will be in the “permanent” list. 2) “Permanent” (My Picks) list. Many thanks for a great app and appreciate your tremendous support. Hi Nico, thanks for your comments. You are right, scanning an item and checking it out won’t add it to “My picks”. Instead, it will be placed in “Automatic picks”. This way we tried to address two most typical scenarios. First, when people want to create their product database upfront, they just go to Menu –> Settings –> Pick list –> My picks and start scanning items (same as Gears –> My picks). Second, when people just want their items to be kept for future use without any additional hassle. 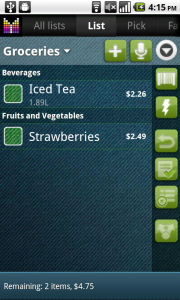 Then they just scan items under shopping list and give them a checkout in their regular shopping mode. Anyhow, we may consider adding an option which will automatically place any scanned item under “My picks”. Unfortunately, popup selection after each scan would just add another click to every scan. Hopefully this makes sense. Miguel, thank you for your question. 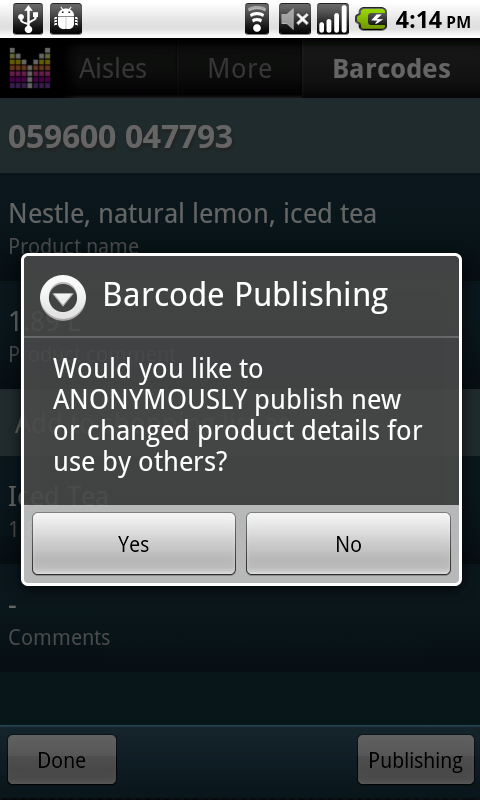 I’d recommend populating your product database using barcode scan in Menu –> Settings –> Pick list –> My picks. Please let me know if you have any further questions. Please can you add Paypal as a payment option to buy ? Paypal payment option is already there. Just have a look at Mighty Grocery Special Edition. I scan barcode items into a list, then immediately go to edit and modify the title, place in aisle etc. 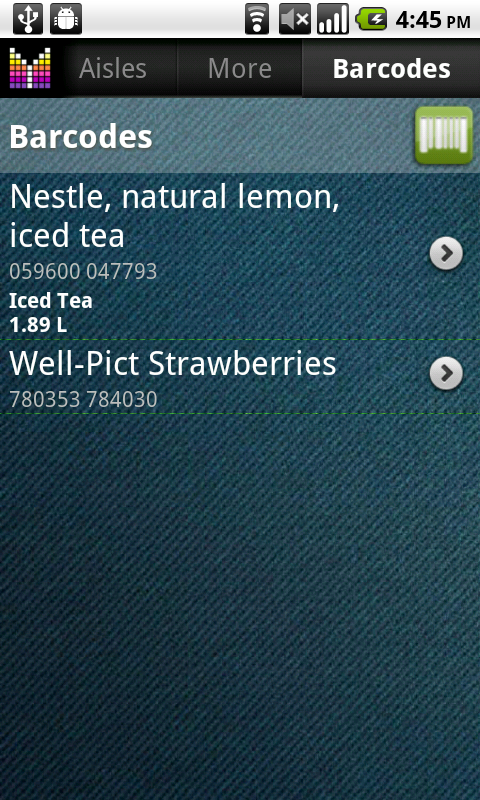 When I am finished the barcode item is in my pick list and in my grocery list and can be found with search. Next I delete the item from my grocery list and it disappears from my pick list and my search but remains in my barcode list. What am I doing wrong? Thanks for the help. Roger, thanks for your question. Kindly note that by default a product remains on the Pick list until there is an item in a shopping list or in the History. This behavior allows to automatically remove any unused products. To keep a product for a long time I’d recommend scanning them in Menu –> Settings –> Pick list –> My picks. Or you can move existing items from Menu –> Setttings –> Pick list –> Automatic picks by tapping Actions –> Add existing products. Thanks Alex. You have been a tremendous help. This app is the greatest thing since sliced bread. Hi Alex, Any consideration to being able to use the barcode scan for coupons? It would be wonderful to be able to scan a coupon to add to the shopping list. I realize that some coupons allow for use on different varieties of a product, but we could edit to our specific needs. Thanks! Hi Susan, thank you for your suggestion. 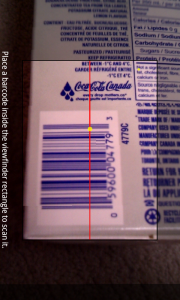 We are going investigate possibility to extract meaningful data attached to coupon barcodes. No doubt it’s going to be a good addition to the application feature-set. Unfortunately, no specific dates yet. 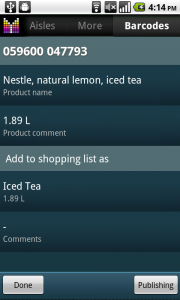 I can’t figure out why my scanned items aren’t showing up in any shopping lists or why I can’t add directly from the Barcode Scan screen. Am I missing something? I’ve tried to search by name and look through all the aisles. It actually would be nice to be able to pick which aisle the scanned items belong. Hi Denise, thank you for your question. 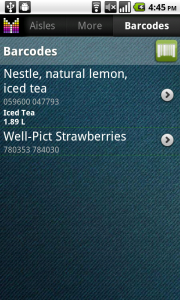 Kindly note that you need to scan products directly in your shopping list in order to see them and assign an aisle. 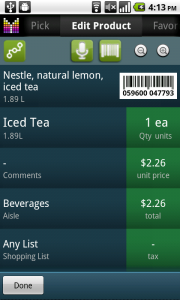 Next time you scan the same item the app should re-use previously entered value. Just FYI — Barcode Scans tab is used to cache your scan results only. this apps sounds very interesting and I’ll have a look the next time and use it. 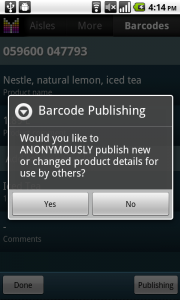 I have a suggestion: Maybe it would be helpful/possible to have a deal with “barcoo” (http://www.barcoo.com/en?brand=barcoo&format=html&lang=en), who has a database of barcodes and the corresponding article data. Could improve the barcoding a lot! Hi, thanks for your suggestion and your vote to integrate with Barcoo scanner. This enhancement is under consideration after discussion on our forum. Why won’t the barcode scanner in mighty grocery list recognize my item but when I go straight to the barcode scanner it finds it. And is there a way to sink the two applications? 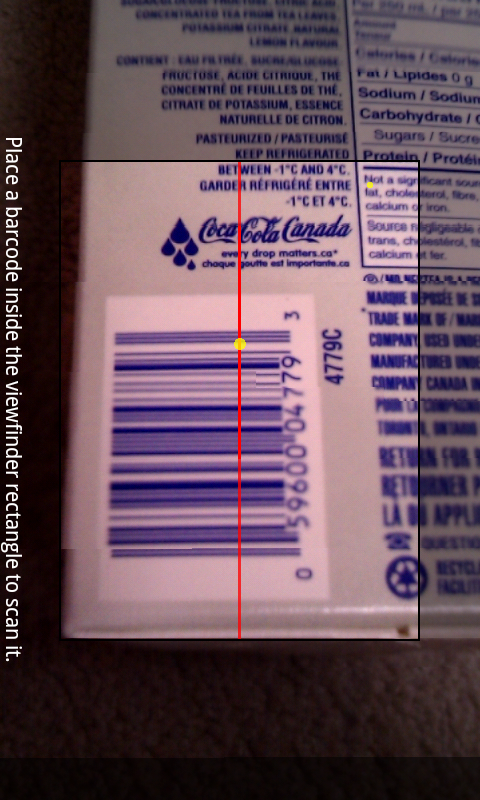 Barcode scanner uses web search to show product details. Unfortunately, search results are not structured and there is no easy way to use that data in Mighty Grocery. We hope to improve successful scan rate going forward. Please see Sync with cloud User’s Guide for more details on how to sync applications. Please could you incorporate Google’s search data when using the barcode. I’m based in the UK, none of my products are recognized in your app, but are always recognised when I use Google Shopper. Hi Guy, thank you for your suggestion. I hope we will have a chance to improve barcode scanning results later this year.